Valentine’s Day is right around the corner and there is nothing more quintessential than romantic chocolate desserts. Even better is this roundup of 50 Romantic Chocolate Desserts for Valentine’s Day. Everything from chocolate truffles, cakes, soufflés, lava cakes, custards, mousse, cheesecakes, chocolate fondue, tarts and so much more! I enjoy reading food blogs and would love to share some of my favorite decadent chocolate desserts recipes. 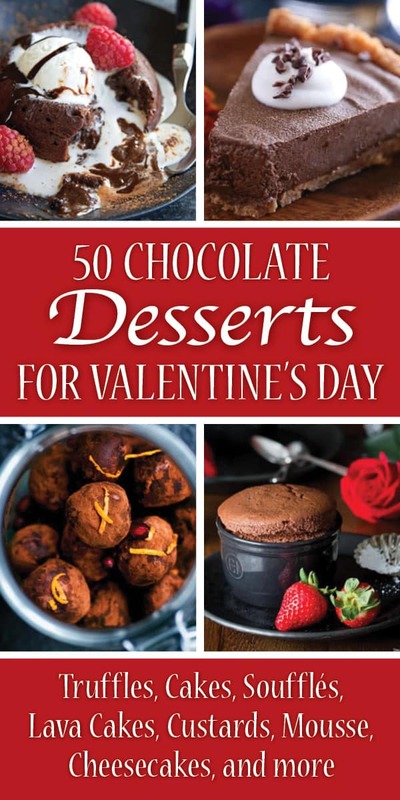 These include quality recipes, cooking tips, plus cookbook and equipment recommendations to help anyone make professional-quality chocolate desserts for Valentine’s Day right at home. Chocolate truffles are the perfect gift for your special someone. What’s more romantic than rich and decadent homemade truffles for Valentine’s Day? I especially love the flavor combination of the Chocolate Truffles with Ginger, Orange, and Pomegranate. And who can resist Godiva chocolate? Godiva Chocolate Truffle Recipe | Pink Fortitude – This is a classic chocolate truffle and would make a wonderful gift. 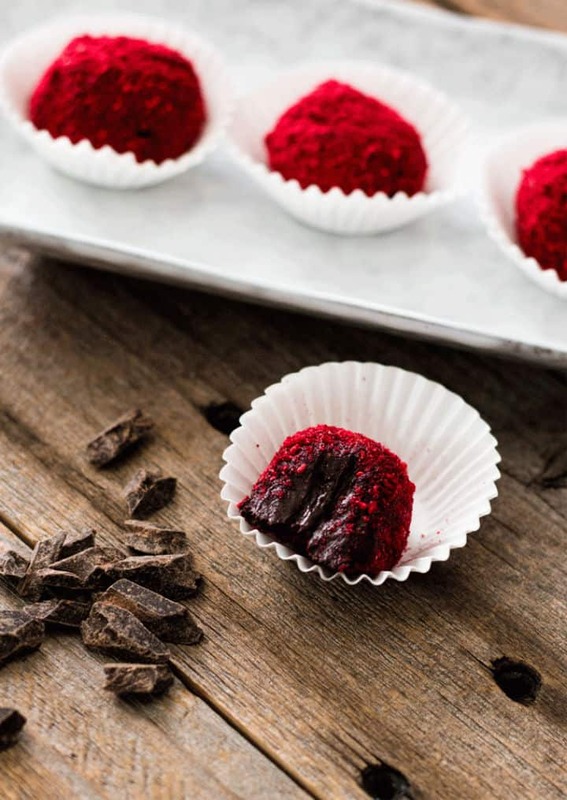 Beetroot Chocolate Truffles | Veggie Desserts – Beetroot? Yes! I loved this creative take on chocolate truffles. So much chocolaty, creamy goodness! These types of desserts are moist, fluffy, creamy and have an oh so romantic feel. Any one of these will bring a smile to your loved one. 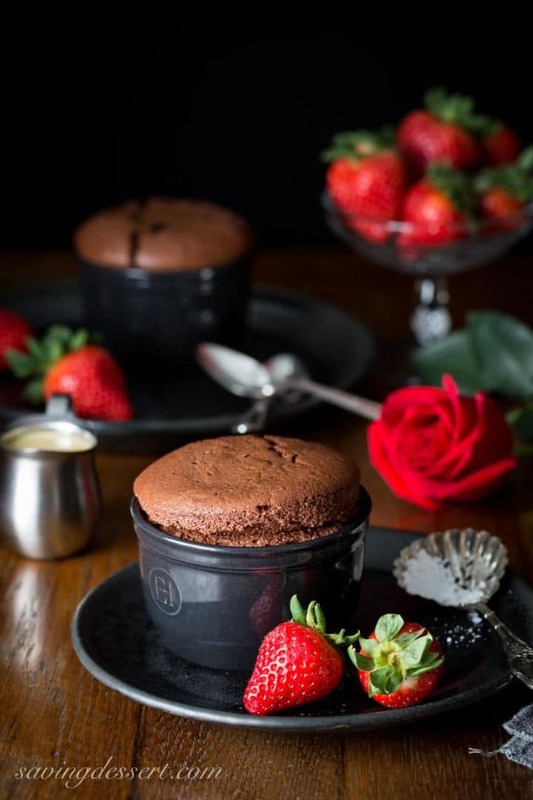 Chocolate desserts don’t have to be intimidating – even a Chocolate Soufflé with Baileys Creme Anglaise. You’ll be baking like a pro in no time with these well-written recipes. Dark Chocolate Mousse Irish Cream | Family Spice – Dark chocolate mousse and Irish cream. This classic pairing doesn’t get much better! Double Chocolate Pudding Crepe Cake | Will Cook for Smiles – Loved this chocolate pudding crepe cake idea. So much more creative than a typical chocolate cake. 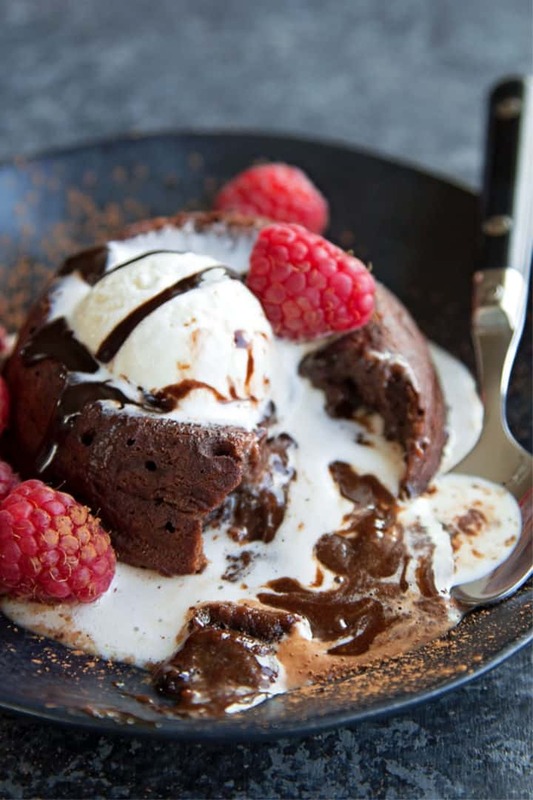 Molten chocolate cake. Need I say more? There are even lighter and gluten-free versions of this classic. If you want an extra dose of chocolate, these chocolate cakes will do that and more. And definitely check out the Red Wine Chocolate Cake with Raspberry Butter Cream. Wine and chocolate are always a fantastic pairing. Marbled Skillet Brownie Cake | Plating Pixels – What’s better than dark chocolate cake and white chocolate cake? Swirl them together and bake in a skillet. Patron Incendio Molten Lava Cake | The View from Great Island – Would you have thought to pair Patron and lava cake? I wouldn’t have. Such a creative chocolate cake. Un Molten Lighter Chocolate Cake Molten Chocolate Cake | Gluten Free Easily – A lighter and gluten-free option for those who want their diet and their chocolate cake too. You’ll score some major cheesecake points if you serve one of these chocolate cheesecakes on Valentine’s Day. They are rich, creamy, dense and loaded with flavor. 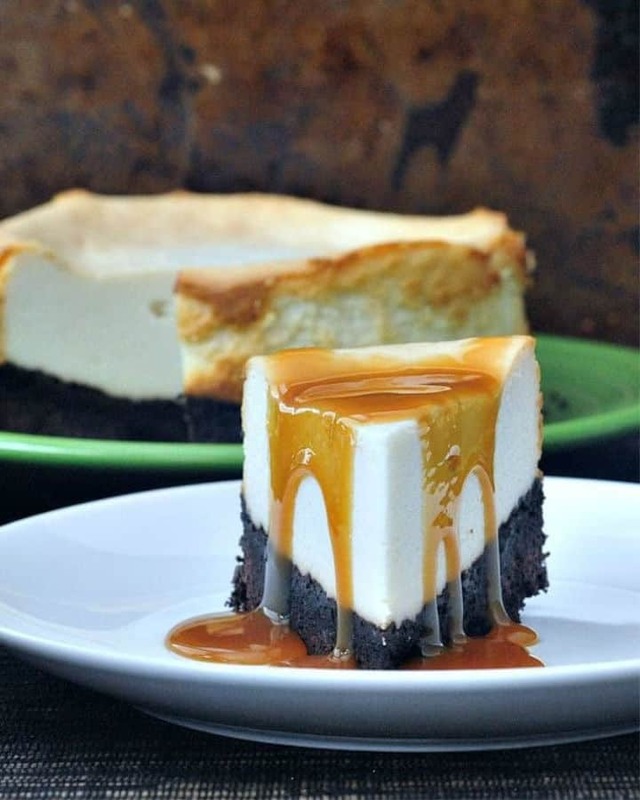 There’s even low carb, Instant Pot and cheesecake bite options – a little something for everyone. 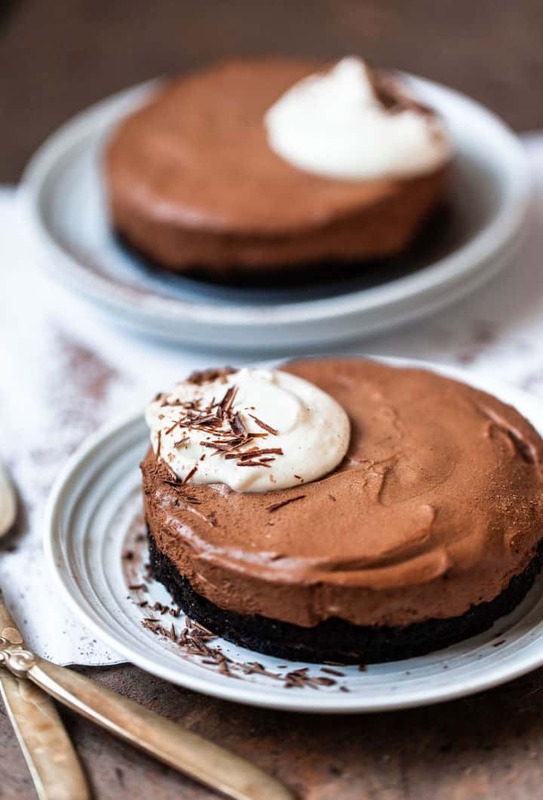 Instant Pot Chocolate Cheesecake | Ginger Casa – If you spent a lot of time on the meal and want an easier chocolate dessert this Instant Pot cheesecake version is a perfect idea. Red Velvet Oreo Cheesecake | Baking Beauty – The combination of red velvet, oreo, and cheesecake is a standout cheesecake recipe for sure. I knew I had to include it in my chocolate desserts round up the moment I saw it. 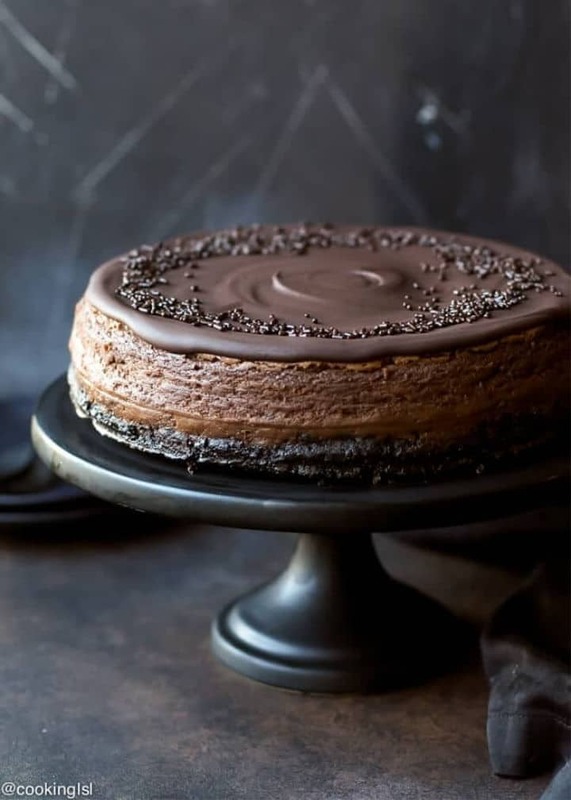 Fudgy Chocolate Peanut Butter Cheesecake | Plating Pixels – Dense cheesecake loaded with peanut butter and topped with a firm chocolate layer. 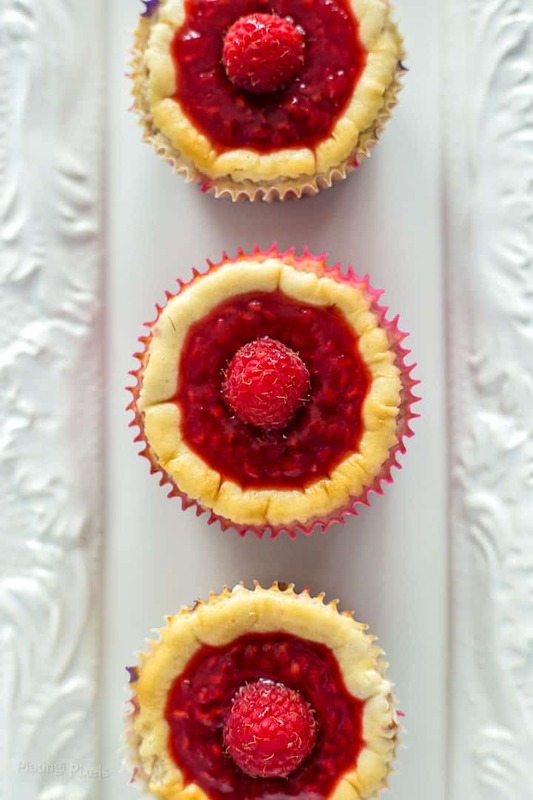 Mini Raspberry Cheesecake Muffins | Plating Pixels – Bite size cheesecakes with a white chocolate surprise inside. Topped with homemade raspberry sauce and fresh raspberries. Strawberry Hazelnut No Bake Cheesecake | Plating Pixels – Made rich and creamy chocolate pudding. This no-bake cheesecake dessert sits on a gluten-free almond crust for wholesome crunch. No-Bake Cheesecake Recipe | Red Ted Art – A no-bake cheesecake is something you can’t go wrong with. Simple to make, and still a showstopper! For something a little different, opt for a chocolate pie or a chocolate tart. They’re still plenty romantic, but provide a unique chocolate dessert for Valentine’s outside of the usual truffles or cakes. If you have a vegan special someone, you’ll want to check out the Vegan Chocolate Tart. 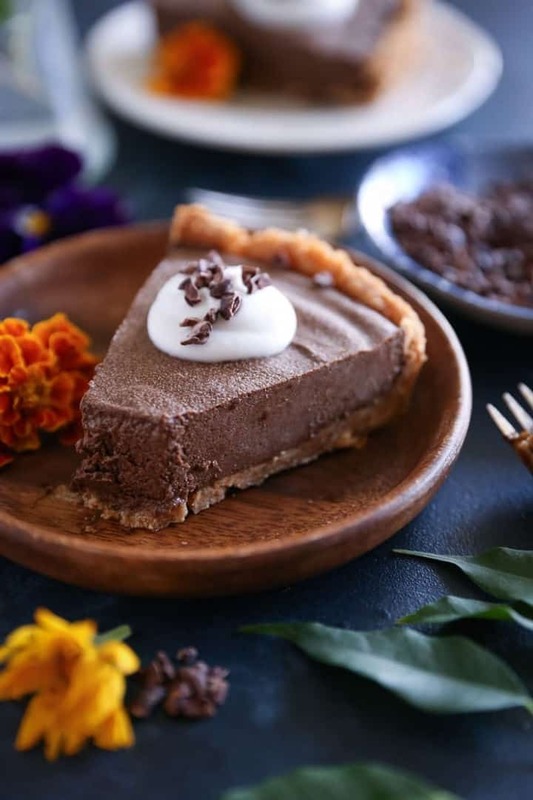 Vegan Chocolate Tart | Delightful Adventures – I love sharing diverse diet options here and this chocolate tart is perfect if your special someone is vegan. Avocado Chocolate Silk Pie | The Roasted Root – I know at first glance, the idea of pairing avocado and chocolate seems a little strange, but it truly works in this chocolate pie. Fondue isn’t just for the 1970s. It’s making a comeback in a big way. These desserts are great for sharing (if you dare). I was especially wowed by the Wine Soaked Chocolate Covered Cherries. Cherries and chocolate make a divine combo that you should definitely try. 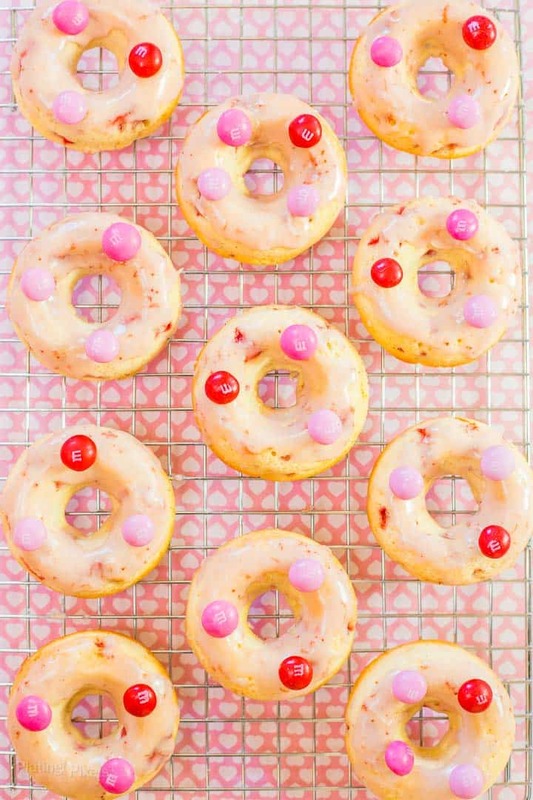 Chocolate Strawberry Glazed Baked Doughnuts | Plating Pixels – A healthier version of donuts that are baked. Why not celebrate Valentine’s Day earlier with dessert for breakfast? Sweet and Salty Dark Chocolate Bark | Plating Pixels – Rich dark chocolate dessert bark with a salty surprise. Chocolate Ganache Covered Strawberries | Sunday Supper Movement – Chocolate covered strawberries are a tried and true Valentine’s Day dessert – and they are so simple to make. 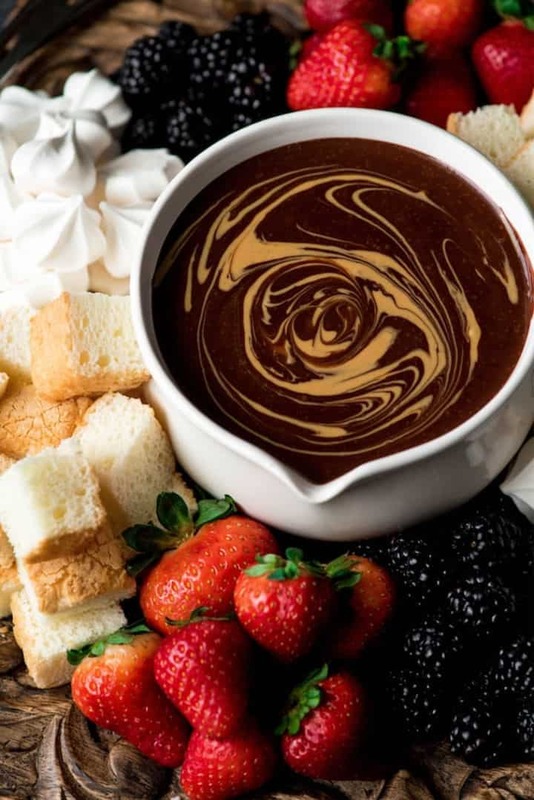 Dairy Free Chocolate Peanut Butter Fondue | Joy Food Sunshine – Again, those with special diets don’t need to skip out on a romantic chocolate dessert – this dairy-free fondue is so decadent. How to Make Bon Bons | Cupcake Project – If you’ve ever wanted to make your own candies, this post is a wonderful step by step guide for making chocolate bonbons. Skittles White Chocolate Fudge | Plating Pixels – A little more on the fun side, with a burst of color throughout. 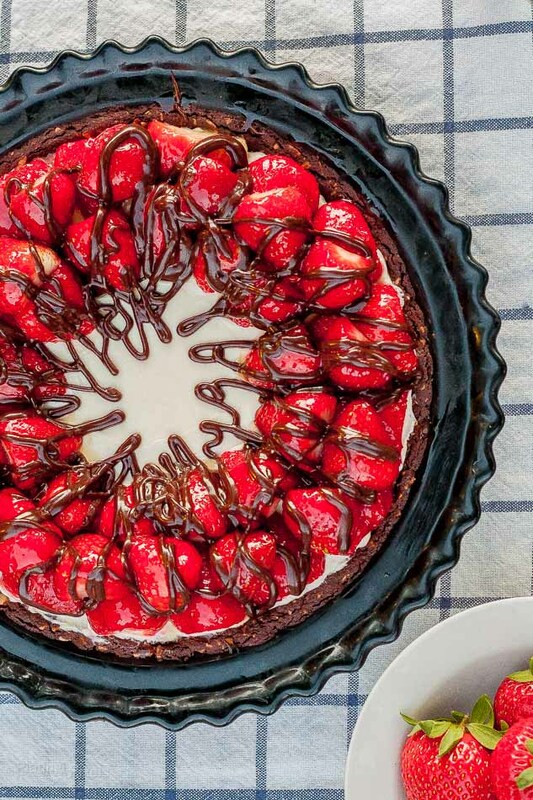 Want more recipes and roundups like these chocolate dessert recipes for Valentine’s Day? Then be sure to follow me on Pinterest, Instagram, Facebook, and Twitter. Also, sign up for our newsletter to get all our recipes and cooking tips. 50 Romantic Chocolate Desserts for Valentine's Day. Everything chocolate from truffles, cakes, soufflés, lava cakes, custards, mousse, cheesecakes, chocolate fondue, tarts and so much more! Thanks so much and you too! So many lovey valentine’s recipes! 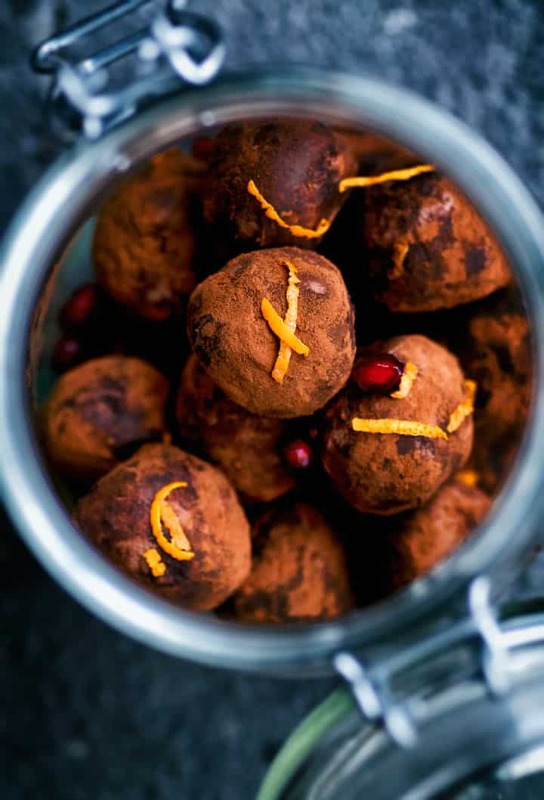 Thanks so much for including my Beetroot Chocolate Truffles! Thanks and you’re welcome Kate! Thanks and you’re welcome Holly! Happy Valentine’s Day. So much yumminess! And not only on Valentine’s Day– 50 recipes is perfect for one a week (except those 2 weeks at the beginning of the year where I pretend to diet!). I can’t wait to try so many of these. I swear chocolate is my love language! That’s my kind of cooking challenge! Thanks Sara. Thanks and you’re welcome Sarah! Thanks for including my strawberries!